Once again, Toyota stock is taking an early morning hit at the open, but is still showing some strength the first half-hour of trading, while gapping down from yesterday’s close per the 15-minute chart. The notice stated that 355,000 vehicles would include the Lexus IS and GS models for fuel pressure valves that may have been installed incorrectly. The remaining 1.3 million of the recall would involve vehicles in Japan only for the Rav4 for fuel sensors. Fact is, yesterday’s close of 83.86 was followed by a slight spike downward during the first 15 minutes of after-hours trading. Then the chart data goes silent; most likely from an impending announcement when stock trading can be halted. By this morning, though, the information was out and the market responded with an immediate opening price downward to 82.69; down 1.17 or 1.3 percent. 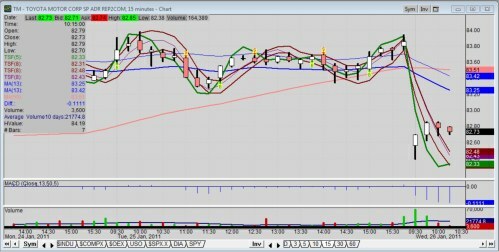 Day traders use intra-day charts like 5, 10 and 15-minute charts. According to the 15-minute chart shown, Toyota stock found buyers right after the open, but met resistance at 10:45 a.m. at 82.85. The first hour of trading is often called amateur hour by the pros, like Jon “Dr.J” Najarian who appears on CNBC’s Fast Money. By the start of last 15 minute segment of the first hour, Toyota stock is showing a lack of buyers. Time will tell, though, if the gap will be filled.